Turnstile Square, Layer Road, Colchester. Layer Road Memorial, Turnstile Square. It was a cold and damp day but my friend, Graham Boosey, and I took a trip to Colchester to record the day’s FA Cup football match against Swindon Town. En route we stopped off at the location of the old Layer Road ground, which is now a new housing estate. There is a statue of a player on the old centre spot, but you’d need a brass rubbing kit to make out the inscription on it. 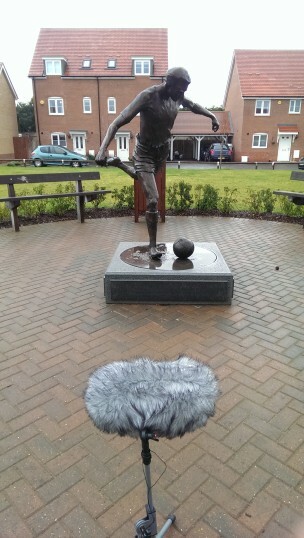 We only recorded for five minutes, capturing the ambience of the residential square, until a man from one of the houses shouted at us from his front door, ‘You’re not interviewing the statue, are you?’ He was very friendly and showed us an aerial photograph he had of the ground as it used to be. Compare these residential sounds with the noise of the same site forty-five years ago.